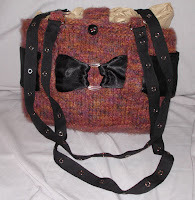 Astrid Cloverleaf: a knitting persona blog: another purse done! Tonight I finished the bag I was making for the FFBE. My downstream should receive it sometime this week as I'm mailing it out tomorrow. She is getting a knitting fiction book, Knitting to go cards since her job makes her travel a lot, some candy and hot tea's, a jingle bell buddy with her name on it... and the bag of course! And the beautiful bag...... is stuffed with paper to fill it out. It took quite a long time to make it and i learned how to felt on this one! It is lovely...this is your spoiler, I ahd hoped to ship by now, but life interfered. I will be shipping Tuesday or Wednesday, hope you enjoy everything.